The Mistah and I began our marriage with different ideas about barbecue. He was a die hard fan of Carolina style barbecue. Only a biting, vinegary ‘que would do for him. That’s what he knew. That’s what he loved. Me, I abhorred the very idea of barbecue. I blame it on the memories of too many chicken dinners that were drowned in Kraft Barbecue sauce. Consider the fact that those bad barbecue memories are from the same period of time that was filled with strife and struggle, and it’s a wonder that I ever willingly gave barbecue a try as an adult. But having been taken to the church of barbecue and worshiping at the altars of Andy Nelson, Salt Lick, RUB, Blue Smoke, and Daytona Pig Stand, I have been born again. No longer do I limit myself to quietly eating salads or sides while others celebrate the glory of pulled pork or smoked brisket. I’m right there rejoicing with them. My voice is full of adoration and conviction as I sing hymns of praise to the pitmaster. I have become a true believing convert. Unlike some other religions, I won’t come knocking on your door and tell you that there is only one true barbecue. I believe that each of us has to develop our own special relationship with barbecue. What’s right for me might not be right for you. And even if you prefer to be agnostic about the existence of barbecue heaven, that’s ok. It just means more pulled pork for the rest of the congregation. BAH Note: This is not a quick cooking dish. Thankfully, the slow cooker will do all the heavy work for you. You just have to be patient and aware of the fact that you may wake up to the smell of slow cooking pork at 4am, like I did. The pork shoulder I used was bone in. The original recipe doesn’t specify bone in or boneless. And honestly, I think the bone in pork gave the juices a meatier flavor. DSD’s recipe also called for whole cloves which I didn’t have. So I used cinnamon stick instead. If you prefer to use cloves, DSD calls for five of them. BAH Tip: When I mixed up more spices to add to the pork after it had cooked all night, I winged it. I pulled jars off the spice rack and started measuring out 1/8 and 1/4 teaspoons of each onto a plate, mixed them up, and then tasted them to see if I was happy with the flavor. I started the pork on a Friday night, finished cooking it on Saturday and let it sit in the refrigerator for a day before serving it. To reheat the pork, let it sit in a low oven (about 250 degrees) for thirty minutes or until warm. Slice two onions and place one half of the slices in the bottom of your slow cooker. Place the pork on top of the sliced onions and add the water, cinnamon stick, and remaining sliced onions. Cook on low for 8 to 12 hours. Carefully remove the pork from the slow cooker and set on a plate to cool. Strain the liquid from the cooker through a fine mesh strainer or one lined with cheesecloth or paper towels. Reserve two cups of the strained liquid and put the rest in the refrigerator. Dice the remaining onion and add it to the slow cooker. Sprinkle the onion with the brown sugar, paprika, salt and pepper. Add the Liquid Smoke and the 2 cups of reserved juices to the cooker. In a bowl, combine the vinegar, Worcestershire sauce, dry mustard, and garlic powder. Pour half of this mixture into the pot. Reserve the other half in the refrigerator. Carefully remove any large pieces or sheets of fat from the pork, remove the bones (if any), and return the pork to the pot. Using two forks, shred the meat well and mix the pork, spices, and liquids completely. Taste for seasoning and add a combination of cayenne pepper, salt, black pepper, paprika, ground chipotle, and dry mustard to taste. Cover and cook on low for another 4 to 8 hours, stirring occasionally. If not serving right away, let the pork cool a bit and refrigerate it until ready to serve. When ready to continue, let the pork sit out for 15 minutes, heat your oven to about 250 degrees, and proceed. Combine the other half of the vinegar mixture, Agave nectar or honey, and one half of the strained pork liquid in a small nonstick sauce pan. Cook over medium heat until the mixture reduces and starts to become syrupy, tasting it occasionally and being careful not to let it burn. This could take five minutes or it could take 15 minutes so you don’t want to wander away. Add the sauce to the pork, stir to combine, and reheat it in the oven for approximately 20 to 30 minutes. P.S. If you have a fat separator, you’ll really want to use it to get most of the fat out of the strained juices. If you don’t, do what I do and let the liquid sit until the fat rises to the top and then carefully skim it off with a spoon before proceeding. Love me some pulled pork. And this is one dish I can pull off thanks to the slow cooker. Ribs are a whole other story – we’ll keep hitting up the Beer Depot for that kind of BBQ eatin’. Beer Depot? Should I even ask? A hole-in-the-wall joint in town. They have a smoker out front. It’s fantastic in the summer; winter’s a bit too cold because there really are holes in the walls. woman, you are talkin’ my talk. I think even I can pull (LOL) this one off Sounds Yummo! Emily, I have seen the light when it comes to the religion of barbecue. 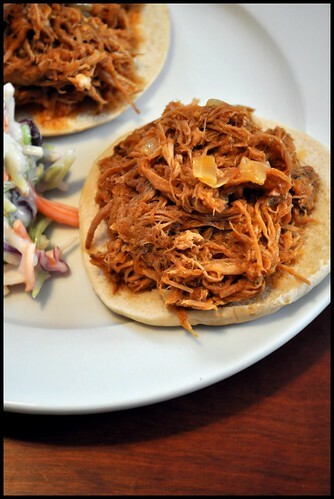 Yum yum – love pulled pork! I usually use country style ribs, which are sufficiently fatty, and cook them for about 4 hours until they fall apart. And yes, meat is usually meatier if cooked on the bone. My family calls Sloppy Joes “barbeque,” so I grew up thinking that barbeque is saucy ground beef. I thought this was a Baltimore thing, but now I wonder if it’s something my family invented on their own. 🙂 It’s good stuff, but I’m not sure if it would be as big a hit with crowds as this pulled pork! I’ve got mixed memories of Sloppy Joes, mainly because they hail from the Kraft Barbecue Sauce era. Is your family from around these parts? I think you need to introduce them to Andy Nelson and his fine pulled pork. Or give this at home version a try. They are in need of a serious bbq intervention….stat! Oh heavens me. YES, that looks awesome and I am going to be making a similar thing this week to clear out that ol pork shoulder in my freezer to get ready for my move. I like some of your ingredients, I think I will add it to my recipe this time! Elizabeth, I wish I had a hunk of pork in my freezer right now so I could make more of this.